The following recipe comes from Cinnamon Spice and Everything Nice a popular food blog full of great recipes. 1. Sift the flour with a pinch of salt into a medium sized mixing bowl or in a food processor pulse once or twice. 2. Cut in the butter using a pastry blender or in a food processor until mixture resembles fine crumbs. 3. Mix in the water gradually until the pastry comes together in a ball. 4. Wrap the pastry well and chill for 30 minutes. 5. Preheat oven to 400 degrees. Roll out the pastry on a well-floured surface with a floured rolling pin. 6. Fold the pastry in half and then in half again, transfer to a 9-inch pie or tart dish. Cut away any excess with kitchen shears or by rolling the rolling pin over the top of the dish. 7. Sprinkle the cheese, onion, Chiles, and shrimp over the pastry. In a large bowl beat the eggs, add the milk and cream and beat again just until well incorporated. Mix in the garlic. Pour into pastry. 8. Bake for 50-55 minutes until firm and golden brown. Let set for five minutes before slicing/serving. *Use fresh shrimp. 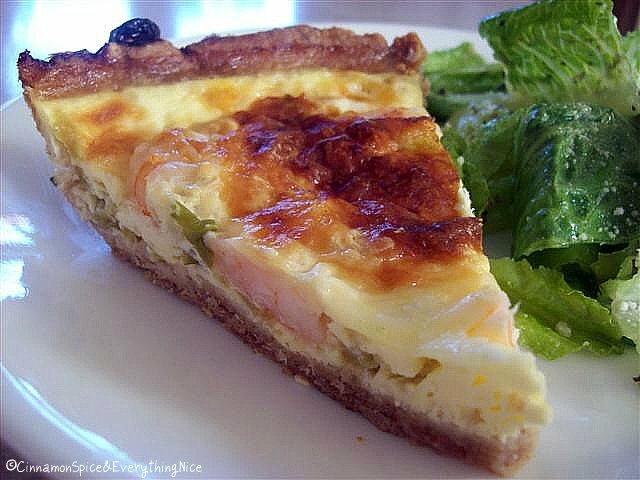 Frozen will render a soggy, water-laden quiche.